Stunning Views, WOW! This cute condo on the tenth floor is a show stopper! Step inside and find that it's also updated and remodeled throughout! All new interior paint, and new carpet! The family room is spacious with a cozy wood burning fireplace, and the dining room or optional sitting room is adjacent! 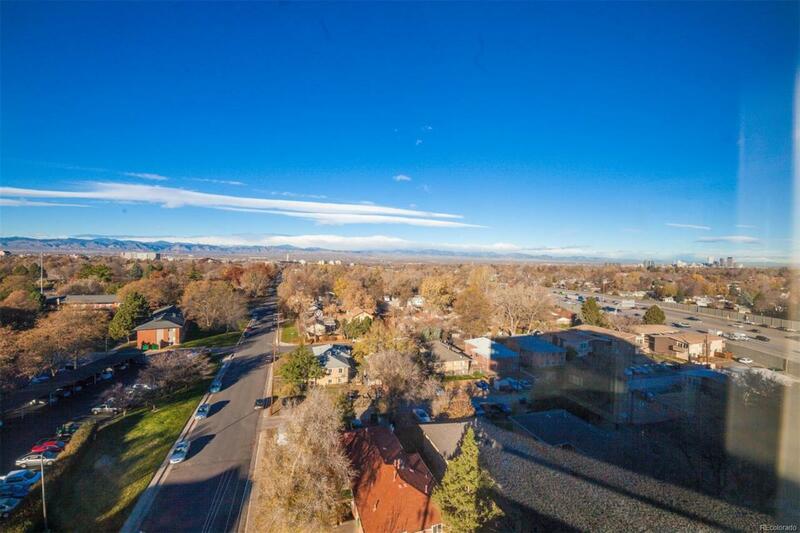 Bask in the sunlight, and admire those gorgeous Colorado Mountains and Downtown city view. The 10th floor and corner unit allow for this incredible view! The kitchen is updated with all updated cabinets, new quartz countertops and the s/s appliances are included! 1 bedroom and hall bathroom, as well as a master bedroom and private master bathroom. That's not all!! -Great HOA amenities that cover heat, water, fitness facility, and pool! Underground parking which means no scraping windshields this winter!! Fantastic location with walking distance to the light rail, shopping, restaurants & more! Make home ownership a reality and show today!